You know when Go Media and The Black Axe get together it is time to pay attention. 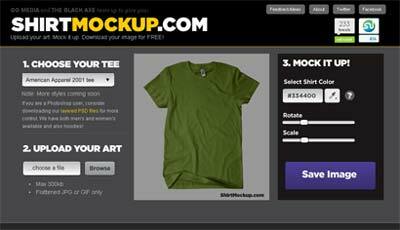 These guys didn’t disappoint with their latest creation aptly named ShirtMockup.com. It is just like the name would imply, a dead simple internet app to create professional grade t-shirt mockups. You can easily select the style of shirt (with more options coming soon) and the color of the shirt. Upload your artwork and then work with the placement on the shirt. Then simply download your mockup. Can it get any easier than that? I don’t think so. Go ahead and give it a test spin….you’ll likely keep coming back!